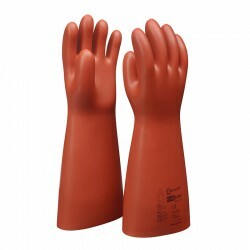 Natural rubber gloves with specially formulated external coating in high-performance orange red elastomer, black inner coating, cut edges, length 41 cm. Sizes 6 to 12. Special proper ties (category) RC, with mechanical protection. Arc Flash assessed by a notified body: box test and ATPV. Three-in-one gloves combining dielectric, mechanical and thermal (arc flash) resistance. Specially formulated outer coating that provides exceptional grip, even in humid or greasy conditions. • Composite insulating gloves with integrated mechanical protection and arc flash rating.